PowerLogix has announced shipment of the first ever software-controlled, variable speed CPU upgrade. Available for the PowerBook G3 Pismo (a.k.a. FireWire or PowerBook G3 2000), the Blue Chip G3 Pismo can be adjusted on the fly (i.e., no reboot required) to a lower clock speed in order to extend battery life. The Blue Chip G3 Pismo is available in 800 MHz and 900 MHz models. Tests show that up to 30 minutes of additional battery life can be obtained by lowering the clock speed, which can be very useful in certain situations, such as long plane flights. In many cases, such as word processing, sheer clock speed takes a back seat to battery life, and the Blue Chip G3 Pismo offers the best of both worlds. The clock speed is user adjustable down to 300 MHz. The Blue Chip G3 features the IBM 750FX PowerPC CPU with 512K of L2 cache running at the same speed as the processor. Willow Design has released two new backpacks specifically designed for the 17" PowerBook, filling out its line of five other 17" PB specific cases. The "short" Edgewater will comfortably fit those from 5' 3" to 5' 7, while the second larger Garibaldi fits those with longer backs, or those who want to carry more extras. Both packs were designed from scratch for the new 17" PowerBook. They both feature extra padded internal dividers to isolate the PowerBook on all sides within the computer compartment and now incorporate a new corrugated plastic stiffener within the the pack body to provide even more stability. The end result is even greater protection for the PowerBook. 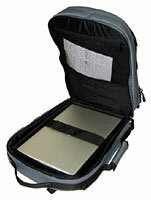 The packs' predecessor, the Titanium Jacques Pack, most dramatically displayed this protection for Chris Yip of Toronto, who ended up using his pack with his G4/800 sleeping in it as a crash pad. Chris was somersaulted from his bicycle over the hood of a car which had cut him off - landing on his pack and then bouncing upright without even hitting his head. Fortunately, and incredibly, both Chris and his Titanium were fine. The new packs feature two main laptop and paperwork compartments with a host of organizer pockets scattered through the packs. Particularly handy is removable accessory pouch to maximize space utilization in the paperwork compartment. The packs also now have special reflective strips for improved nighttime visibility and safety on the front, sides, and shoulder straps of the pack. Both conveniently convert to a shoulder bag or briefcase style cases in seconds for more formal occasions. The Edgewater and Garibaldi both feature Willow's lifetime guarantee against defects in materials or craftsmanship, as do all Willow's other products. Pricing: $238 Cdn., $162 U.S. 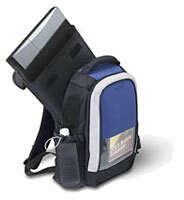 The Parkway II Backpack by Belkin gives you a great way to carry your notebook, books, and supplies between classes. The lightweight Parkway II Backpack features a padded rear panel to cushion your shoulders and back, and a durable, soft mesh handle for easy lifting. The removable padded computer sleeve protects your larger-size laptop. There's plenty of room for pens, pencils, ID cards, paper files, CD or MP3 players, and floppy disks. The Parkway II features a clear front compartment that shows off your drawings, photos, or any paper you want to keep handy and protected. Padded-removable insert for larger laptops - up to 11.5" x 13.5" x 1.25"
The Freeport II Backpack by Belkin packs all your electronic essentials and gives you maximum comfort as you travel. In addition to its lightweight design, the Freeport II features a padded external support panel to cushion your shoulders and back, and a soft, sturdy handle for easy lifting. The removable padded computer sleeve protects your larger-size laptop. There's also plenty of storage room for pens, pencils, ID cards, paper files, CD or MP3 players, and floppy disks. There are external pockets for your cell phone and PDA as well. Protects your notebook with added, removable insert section, measuring 11.0" x 14.0" x 2.0"
12" Racer-X dimensions = 12" x 10" x 4.5"
15" Racer-X dimensions = 14.5" x 11" x 4"
17" Racer-X dimensions = 16.5" x 11.6" x 4.5"
This new sleeve for the 17" PowerBook was designed to be a simple yet stylish leather case for Apples new 17" PowerBook G4. Made of durable full grain leather with 1/8" padding in front, back, and sides, your PowerBook will be well protected. The PowerBook sleeve is made for people who don't want a full sized notebook computer bag. 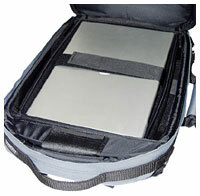 It can either be carried by itself or can be placed into a briefcase or backpack and your PowerBook will be protected. The Sleeve also features a zipper on all three sides, leather piping, and handles. The Sleeve is backed by a lifetime warranty. Vicomsoft has announced that the countdown to the end of spam has begun. With the release of SpamBolt, a brand new and inventive server-based anti-spam solution at the end of May 2003, spammers can see that the end in sight with SpamBolt promising to bolt the door on Spam forever. For many years Vicomsoft has been developing innovative and original software that combats a great number of the problems that businesses and institutions face from Internet threats and security issues. During this time, an annoying side effect of electronic communication has reared its ugly head and is plaguing organizations in the global marketplace. This scourge of the Internet age is everywhere; unceasing and relentless. It carries with it harmful viruses that can infect networks in the blink of an eye, while also spreading unsavory and distasteful content around homes, businesses and schools, without a thought for who might see these horrors of the inbox. These unsolicited emails are also blocking up precious company bandwidth and bombarding domains with unwanted junk mail that costs literally millions of man-hours each and every year to clear. The worst aspect of all though, is that spam is on the increase. Organizations around the globe are just now beginning to realize that the problem is out of control, and spam is very quickly becoming the biggest threat that the Internet has ever seen. Vicomsoft has also been a victim of unsolicited mail on a grand scale; a fact that prompted their renowned and experienced development team into action to create the most effective and safest anti-spam software solution ever launched. The name of this ingenious server-based anti-spam solution is SpamBolt. Once installed on a network, SpamBolt will instantly begin to protect mail servers from spam attacks, while providing the system administrator with a powerful set of mail rules that ensure spam is blocked forever-- and important and genuine emails are led safely to their final destination. At last, companies and institutions everywhere can bolt the door on spam and start to communicate effectively again with like-minded users around the Web. SpamBolt locks away junk mail, keeping your inbox and your bandwidth free, while protecting users from the seedy, offensive, and downright disgusting elements that lurk within unsolicited emails. The countdown to the end of Spam has begun. A 30-day evaluation version of SpamBolt will be available at the end of May 2003 to download from http://www.vicomsoft.com for Mac OS X and Microsoft Windows NT 4.0, 2000, or XP.